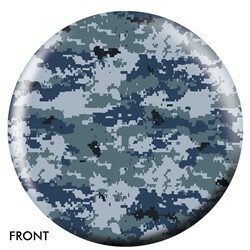 Bring this unusual Blue/Grey Camouflage ball to your alley and stand out while destroying the pins! Is it possible to design a camo ball to have additional logos on it over the print? Hello Mark. That is a great question. To better assist you, you would need to contact On The Ball Bowling. OnTheBallBowling did not tell us why they do not make these balls in a 13lb. Due to the time it takes to produce the OnTheBallBowling Blue/Grey Camouflage ball it will ship in 1-2 weeks. We cannot ship this ball outside the United States.